Ornate Hearse It was hard to capture the detail on this thing. It was so ornate and so detailed. 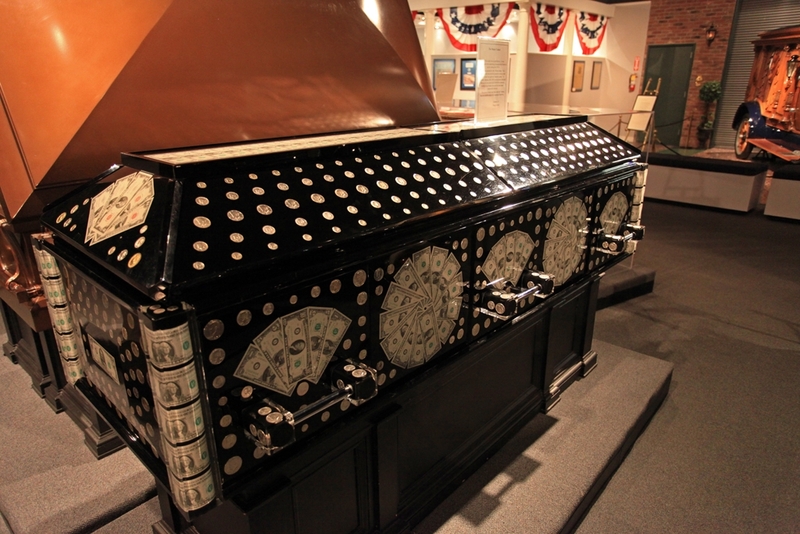 The Money Coffin At the Funeral History Museum in Houston is this coffin covered in money sealed in lucite. It was never used. Later that evening we went to Anvil (The good bar. And it was.) with our Houston based friends which was a nice salve to our disappointment over Forbidden Gardens. The next day we headed out again for some sight seeing, and other touristy activities. 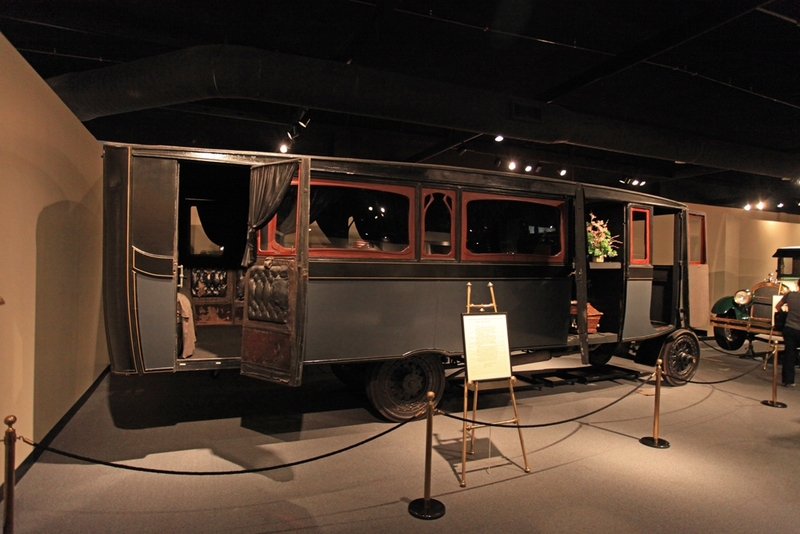 This time we avoided the toll roads which cost us $9 to go one mile the day before, and so we bounced through the rutted roads of Houston to our first stop, the National Museum of Funeral History. 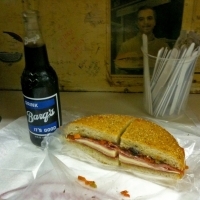 It’s in an unlikely neighborhood, in a pretty nondescript building, but inside it’s pretty cool. 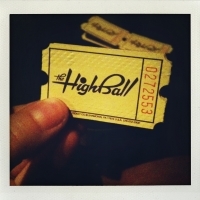 It’s $10 to get in, and at the entrance has a gift shop that is a Goth teenagers dream. 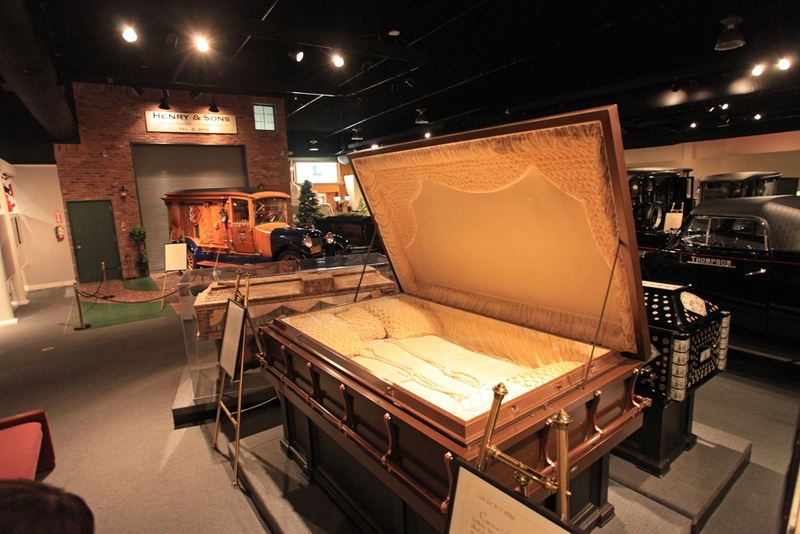 The museum has a large array of fancy hearses, from super ornate Victorian horse drawn ones as well as motorized 20th century Cadillac based ones. They have a lot of information on Presidential funerals, with an emphasis on JFK and Lincoln, (Sorry McKinley.) as well as a big exhibit on Papal funerals, which like all ceremonies related to the Pope, is long and complicated. 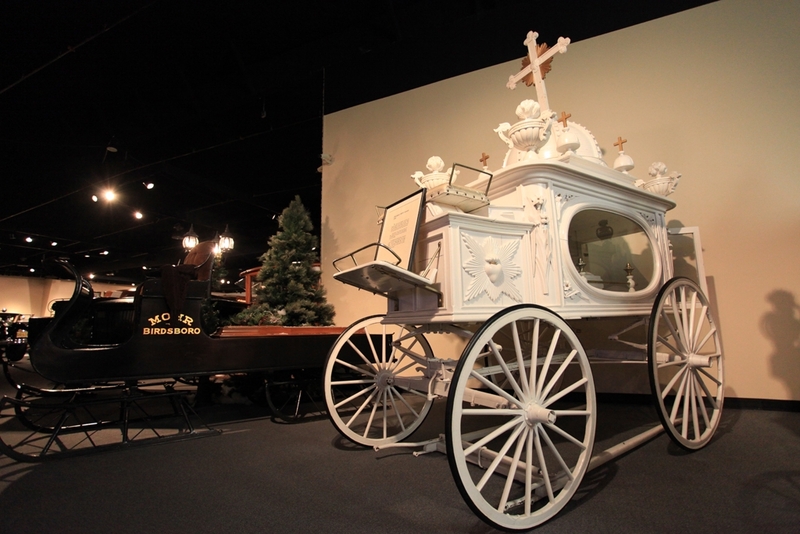 They are currently running an exhibit on cowboy funerals, and when we visited they had exhibits on Day of the Dead and fantasy coffins of Ghana. The fantasy coffins are wooden coffins shaped like jets, Mercedes Benz cars, fish or something that was meaningful to the deceased. They are super cool. The Land Rover Pope-mobile was pretty random, and not even in the Papal funeral exhibit, less random was the section on the history of embalming, which I knew a lot about already. (I blame reading “This Republic of Suffering: Death and the American Civil War.”) The highpoint of their coffin collection, besides the one shaped like a KLM Jet, was definitely the one with at least a couple hundred dollars of silver coins and bills set into lucite. It looked like they were adding a new permanent exhibit on celebrity funerals when we visited, which should be pretty interesting. It’s not the biggest museum in Houston, but it’s definitely one I’d recommend seeing, you can see art anywhere, but there’s only one funeral museum! Coffin Built For Three This creepy coffin was commissioned for a family that lost their kid and planned a suicide pact with the idea of everyone being buried together. After ordering it though they never picked it up. Our next stop was the Rothko Chapel, which we’d heard a lot about, it’s always high on the list of must see places in Houston. It’s a non-denominational church with 14 black paintings by Rothko that were commissioned especially for the building, apparently he spent the last 5 years of his life working on them, and then committed suicide right before the building was finished. Personally I think a series of black paintings is probably not the most cheerful thing to work on when depressed. I take Gretchen (our Chihuahua) everywhere, and when we go in buildings she goes into a carrying bag. So as I walk up to the door, she hopped in, and as we were looking at postcards in the lobby, which was as far in as I was planning on going, the person who was running the desk came in from outside and rather rudely told us to leave, even before I could buy a postcard. They also don’t allow pictures inside, (nobody was there, so we wouldn’t have disturbed anyone if we had taken a picture.) so our visit was kind of a bust. It’s also not that interesting of a building, It kind looks like a bland example of an electrical company substation, PG&E could have come up with something better. Apparently the process of designing it was not very smooth as it had 3 architects plus Rothko. It’s just kind of there, and if you didn’t know what it looked like you’d probably overlook it, until you saw the sculpture garden. If you are in Houston and the roads are driving you to distraction and you need a place to meditate, then this is the place for you, otherwise... meh. Funeral Bus The idea was to keep the procession all in one vehicle. This was only used a few times in San Francisco until it rolled back down the hill spilling all passengers and the casket into the street. I was warned about the sprawl of Houston, and it definitely lived up to it’s reputation. Houston is enormous, and really flat, if it didn’t have a downtown with tall buildings you’d have no point of reference. It’s a lot like a huge Sacramento, in that there’s no way you are walking between destinations. Like Sacramento, it would be vastly improved by a few million trees, they would cut the smog for one, and obscure all the freeways! Somebody should get on that.